Psarou holidays take you to a beautiful golden bay along the south coast of Mykonos. The crystal clear waters off the coast are filled with luxury yachts, with rugged cliffs stretching up into the hills which are home to luxury hotels and villas. The beach is the perfect place to relax, with its picturesque surroundings and excellent beach bars where you can order drinks and refreshments right to your lounger. Inside the town of Psarou itself you’ll find a selection of bars, restaurants, and upmarket clubs. It’s ideal for couples, with fine dining menus where you can select from delicious fresh seafood and some spectacular international options. If you prefer to explore further afield book a boat trip and enjoy the wind in your hair as you sail through the waves or take the 10-minute drive into Mykonos Town. Here you can make the most of the luxury boutiques, bars, and a further selection of restaurants. Psarou is one of the most exclusive towns in Mykonos. There are plenty of opportunities to relax on the golden sandy beach, while being pampered from head to toe with lounger service, as well as enjoying the sailing trips. When it comes to the ultimate indulgence, most of the 5-star hotels in the resort have a spa where you can take in views as you unwind with a massage. Book your luxury holiday in Psarou with Sovereign today and you can focus on relaxing, knowing you’re in safe hands. Each of the hotels we offer has been tried and tested, and all of our holidays come with selected airport lounges and private transfers as standard. 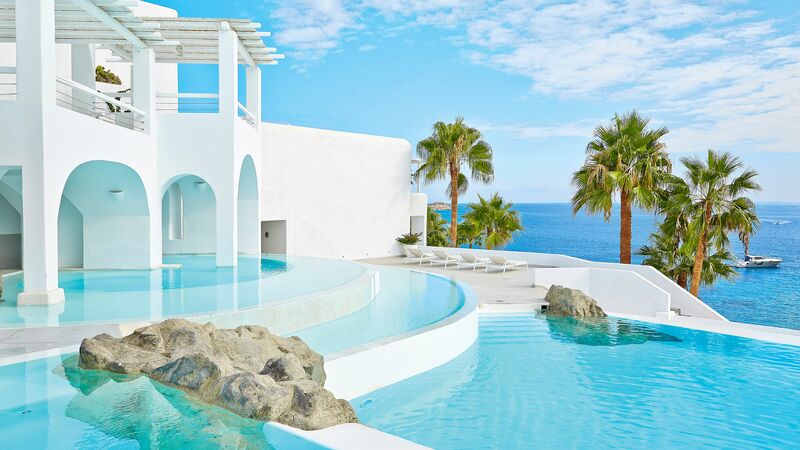 Stay at the Grecotel Mykonos Blu for the bright blues and whites Greece is so well known for, as well as an infinity pool which overlooks the private beach. In my opinion, Psarou is home to the best beach on the island. Nammos Beach Bar is my preferred spot. Pre-book a lounger and you won't want to leave all day! Don't make a dinner reservation, either - the atmosphere is so laid-back, just start with lunch and see how the day takes you into the evening. Transfer time from Mykonos airport to Psarou is approximately 15 minutes.